This recipe is brunch goals. The creamiest grits. Chewy soy curls seasoned with mouth watering cajun spice. Paired together it is the ultimate comfort food. Admittedly, this isn’t the quickest recipe to make, because to it takes a good chunk of time to make grits properly, but it’s so easy! Grits just need an occasional stir as they cooks to avoid clumps and keep them from sticking to the pot. If you’re looking for something pantry friendly, easy to make, gluten free and vegan for brunch then this recipe is for you! That being said, don’t be limited by the brunch title, this makes a seriously delicious dinner entree as well. When it comes to grits, they need to creamy and tender. A long simmer makes sure of the tender and soft texture. Thick cashew cream takes care of the creaminess (substitute canned coconut milk or unsweetened soy cream to make it nut-free). And don’t forget the jalapeño because jalapeño grits are always better than plain grits. Right? Grits are made of dried corn that have been stone ground to a coarse texture. It’s cooked to make a thick porridge and is a Southern United States staple. If you’ve ever eaten soft polenta it’s quite similar, differences seem to depend on what article your google search takes you to (apparently). 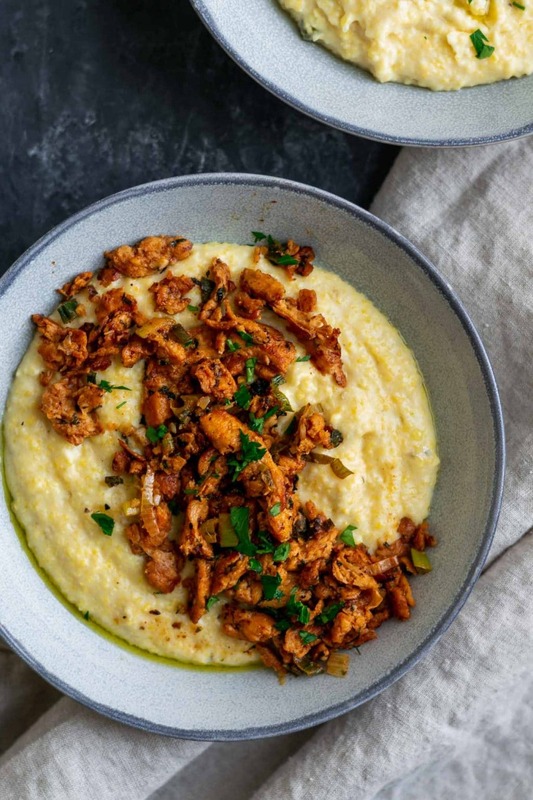 That being said, general consensus is that grits are made with a very coarse ground white corn while polenta is more commonly made from a yellow corn and can be ground more finely [there’s some interesting history on grits vs polenta in this article if that’s your thing]. It is possible to find quick cooking grits, or “instant” grits, and in some places that might be more easily found than the whole grain version I used in this recipe. These grits cook faster because they are polished, removing the hull and germ. If you use quick grits you should follow the cooking times listed on the package. That being said, stick with the good stuff if you can for a better final texture (+ the extra fiber and nutrition!). I guess you can think of this as a veganized shrimp and grits, but I don’t like to because shrimp give me the heebie jeebies. Ya know. So, I’m not trying to make a vegan shrimp here, but instead am doing a spin off on the flavor profile. Cajun spice, garlic, green onions, parsley, smoked paprika, and a squeeze of fresh lemon combine for the most delicious blend of flavors. Soy curls are a yummy gluten free and vegan protein (you can buy them on Amazon) and are essentially TVP in a larger shape. Soy curls need to be hydrated with boiling water, then you’ll want to squeeze out as much as that water as possible. They’re then able to fry up chewy and even crispy and soak in any liquid that you add. You can substitute seitan or your favorite vegan chicken. 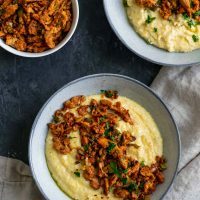 They will not soak up the broth the way that soy curls with, but that’s fine–a brothy topping over the grits is yummy, and sometimes the goal. I made my own cajun spice blend, and you can find the recipe for that in the notes below the main recipe. Substitute a store bought spice blend if you’d like. And for the near future I think I’ll be adding that spice blend to everything. It’s real good! 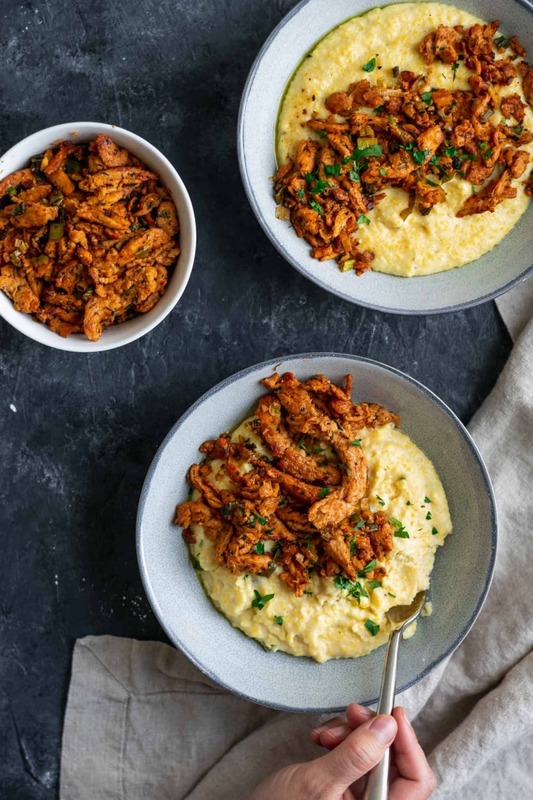 Let me know if you make these cajun soy curls and creamy vegan jalapeño grits! Leave a comment below, tag me on Instagram (@thecuriouschickpea or #thecuriouschickpea), or share with me on Facebook. Enjoy your vegan grits! If you end up buying the 6 pack of soy curls from amazon (and you probably should) and need more soy curl recipes, I’ve got more for you here! Hydrate the soy curls as soon as you’ve started the grits, drain them after the second dose of coconut cream is added and cook them with about 15 minutes to go on the grits. If you don’t want to make cashew cream, use canned coconut milk, or substitute a plain, unsweetened non-dairy creamer or half and half. But I highly recommend the cashew cream if you’re not allergic and able to make it. The starches from the cashews make an extra thick and creamy grits. 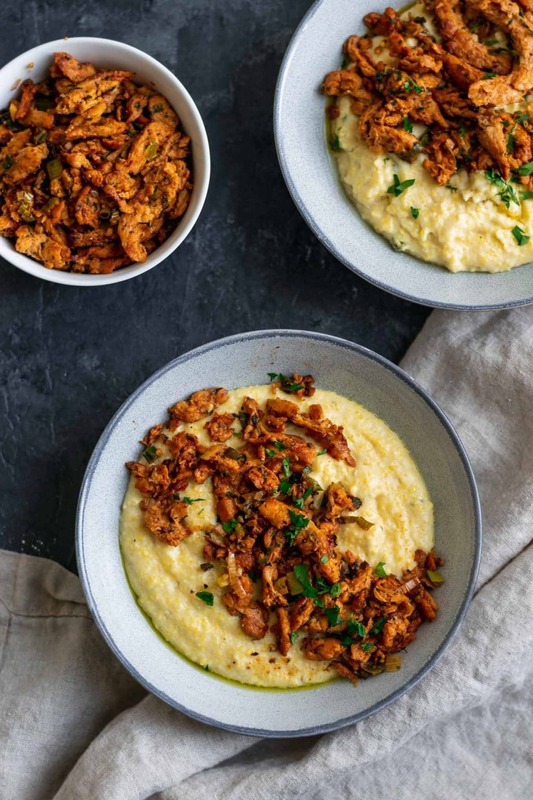 Creamy jalapeño grits are topped with super flavorful cajun-spiced soy curls for the perfect vegan and gluten free brunch. A plant based take on the traditional southern dish cajun shrimp and grits. In a large pot bring the water, vegan butter, and salt to a boil over high heat. Slowly pour in the grits, stirring constantly. Lower the heat to a simmer and cook covered, until the water is mostly absorbed, about 15 minutes. Stir frequently to prevent the grits from sticking to the bottom of the pot. Add 1/2 cup of cashew cream and let cook covered for about 10 minutes, stirring occasionally. Add the remaining 1/2 cup of cashew cream and the minced jalapeños and cook the grits for 30-35 minutes, until the mixture is soft and tender and ultra creamy. Stir occasionally to prevent sticking. In a large heat safe bowl, add the soy curls and add enough boiling water to cover. Place a lid over the bowl and let the soy curls rehydrate for 20 minutes. Drain the water from the bowl and then when the soy curls are cool enough to handle squeeze out as much water as you can. Heat a large skillet over medium heat and add 2 tbsp of oil. Add the soy curls and fry for 5-6 minutes, or until golden. Push the soy curls to one side of the pot and add the remaining 1 tbsp of oil. Place the minced garlic, scallions, parsley, cajun spice, smoked paprika, and salt and let fry for a few seconds before combining with the soy curls. Cook the mixture for 1-2 minutes, then add the broth. Let the soy curls cook an additional 2-3 minutes, stirring frequently to prevent sticking. Turn off the heat and season with black pepper and add the lemon juice. Deglaze with more broth if needed. Taste and adjust seasoning as desired. 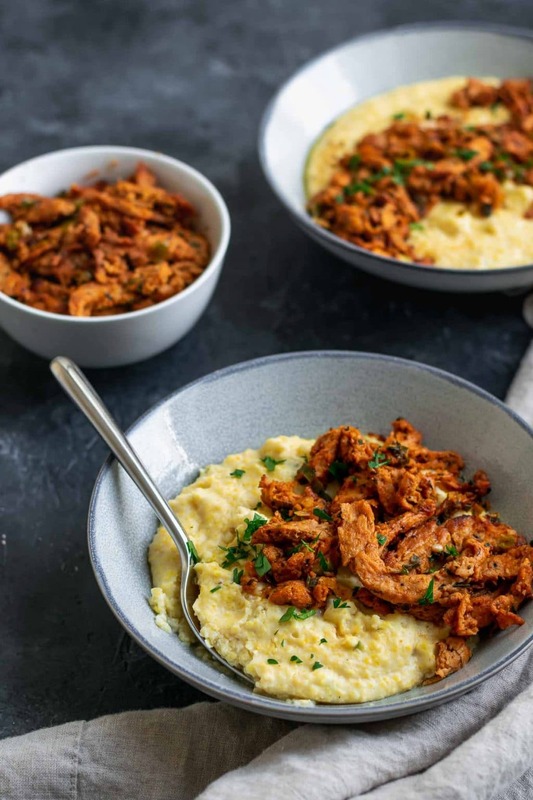 Serve the grits hot with the cajun soy curls and garnish with cilantro. Enjoy! *Make cashew cream by blending 1 cup of cashews (soaked for 30 minutes in boiling hot water, then drained, if not using a high speed blender) with 1 cup of water. Or substitute an unsweetened non-dairy creamer. *To make the cajun spice blend mix together: 1 tbsp salt, 1 tbsp cayenne pepper, 1 tbsp garlic powder, 1 tbsp paprika, 1 1/2 tsp onion powder, 1 tsp oregano, 1 tsp dried thyme, and 1 tsp freshly ground black pepper. This will make extra. Alternatively use a store bought cajun spice mix. This was delicious and satisfying. I cant wait to try different spice combinations. That’s great to hear, so happy you enjoyed the recipe! Thank you for reporting back!